The Lower Left is also where we need to consider how zeigeist morphs and its influence on the ‘climate’ for social change. As discussed earlier, the 1950s was a deeply conservative time in the United States. Stephen Perrin & Christopher Spencer (1980), in trying to explain their failure to replicate the results of Solomon Asch’s famous lines experiment (1951), attributed the difference in conformity to the conservatism of 1950s America as against the liberalism of England in 1980. They particularly pointed out the effects of ‘McCarthyism’, the strong ‘all-American’, anti-Communist hysteria across 1950s US which made many people frightened of being different for fear of being branded ‘un-American’. In contrast, having gone through, first, ‘hippie culture’ and then the ‘punk revolution’, Britain at the start of the 1980s was a much more liberal, anything-goes/express-yourself kind of place than it had been. Support for Perrin & Spencer comes from Nigel Nicholson, Steven Cole & Thomas Rocklin (1985) who found a modest but quite definite level of conformity among British students. Nicholson, Cole & Rocklin attributed the increase in conformity to the greater sense of national social cohesion which developed from Britain’s engagement in the Falklands War. 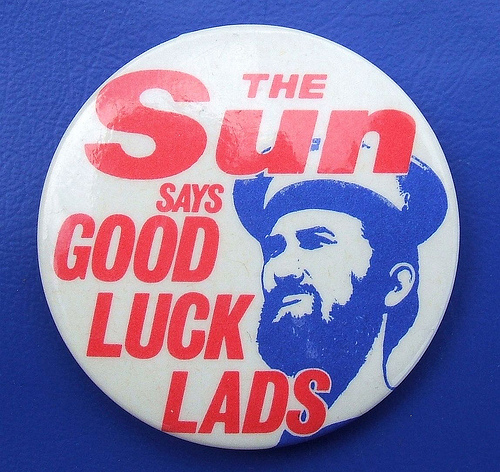 During the war, most of the mainstream media put on a great show of patriotism, making it de rigeur for most citizens to appear to support the war effort (David Morrrison & Howard Tumber, 1988). This, it could be argued is a case of the Lower Right manipulating the Lower Left. Thought the term ‘zeitgeist’ is not always used, the idea that different eras produce different cultural outlooks is enshrined in popular Western mythology. Thus, the 1950s were deeply conservative while the 1960s were radical and avant garde, with change a near-constant occurrence. The 1970s didn’t produce much of a strong identity beyond the iconclasm of punk. In contrast the 1980s, epitomised by Margaret Thatcher and Ronald Reagan, eventually came to be characterised by as the decade of self-aggrandisement by the ‘me-me-me generation’. Feminism, anti-racism and an increasingly liberal attitude towards homosexuality were just some of the major attitudinal shifts that came from the zeitgeist of the 1960s. The success of the gay rights campaigns – in the Western world at least – is indicated by the increasing acceptance of homosexuality, as shown on the graph right. Changes in the size and composition of the population can have important effects for other aspects of a society. The construction industry, building materials suppliers, and other ancillary businesses profited from the building of new schools and related activities. The effects of change in the composition of a population can have dramatic effects on both economic and social factors. The UK, like much of the Western world, is faced with substantial increases in the ageing, post-retirement segment of the population. The Government, like many of its counterparts in the West, is only just beginning to wake up to the impact this increase in a non-contributory, high dependency segment will have on welfare benefits, health care, accommodation, transport, etc, etc. At the time of writing, it seems hardly anyone is yet talking openly about the higher taxes which will need to be levied on the smaller, younger working segment of the population which will have to fund the state pensions, health care provision, etc – or the likely resentment that those workers may feel towards the Government and the ageing population which will compromise their own standard of living. The reaction of the working population to these demands upon them is, in 4Q/8L terms, the Lower Right Quadrant impacting upon the Lower Left. There will need to be a manipulation of culture in the Lower Left, enabling the BLUE and GREEN vMEMES, so that the workers see it as their duty (BLUE value) to provide for those whose ability to provide for themselves is diminished (GREEN value). Given Clery’s (2012) identification of a clear and growing resentment in Britain of the ‘benefit culture’ (discussed earlier), manipulation of public support for the elderly will need to be undertaken sooner rather than later if large-scale resentment of such support is to be avoided. Unfortunately for the Western world, there is still, at the time of writing, little public demonstration of understanding amongst the political intelligentsia of how the processes of Capitalism and the New International Division of Labour are leading to ever-increasing rates of unemployment with all the social problems that produces – see: Underclass: the Excretia of Capitalism. The implications of such failure by leading politicians (of all persuasions) are far from clear at this stage. However, if the societal structure and the mechanism for running society in the Lower Right start to collapse under the weight of too much demand and not enough funds, then we are likely to see a cultural regression down the Spiral in the Lower Left, particularly if stoked up by RED-driven demagogues (Upper Left). However, clearly some thought is increasingly being has been given to how changes in the Lower Right Quadrant will affect the Lower Left in that politicians are already talking about cultivating the ‘power of the grey vote’ (Helen Cleary, 2013). Since older people tend to vote more than young people and be more conservative in their outlooks, it seems not unlikely that we will see a general drift in politics more to the right. Another example of the Lower Right population demographics impacting on the Lower Left is the increasing representation of Muslims in the population and the attitudes of both the majority whites and other ethnic minorities towards that. There is significant evidence of increases in crimes related to racial and religious discrimination, especially following terrorist incidents and/or UnIslamic State atrocities – see the Blog posts The Meaning of Charlie Hebdo…for Islam and the West and Muslims, take back Your Religion from the Psychopaths of UnIslamic State! For example, Sonia Elks (2012) reports that hate crimes prosecuted in 2010/2011 were 10% up on the previous year. This issues involved in accommodation of a different minority culture is covered in greater detail in Islamification: Europe’s Challenge? It can be argued – and indeed was predicted by some commentators (including me – see the Blog post, Cameron & Clegg: where’s the Vision?) – that the recession and government cuts (Lower Right) would lead to an increase in racial and ethnic tensions (Lower Left) as competition for jobs and other resources increased. So far there has been little large-scale ethnic violence. However, the English Defence League (EDL), with its explicit anti-Islam agenda, formed in 2009 in the early days of the recession, has seen its membership mushroom. Matthew Taylor & Peter Walker report that in 2011 EDL membership had grown to 35,000 in just 2 years. Taylor & Walker quite researcher Matthew Goowin as describing EDL members as “economically pessimistic and insecure working-class men who are most likely to feel threatened by changes such as immigration and minority Muslim communities”. 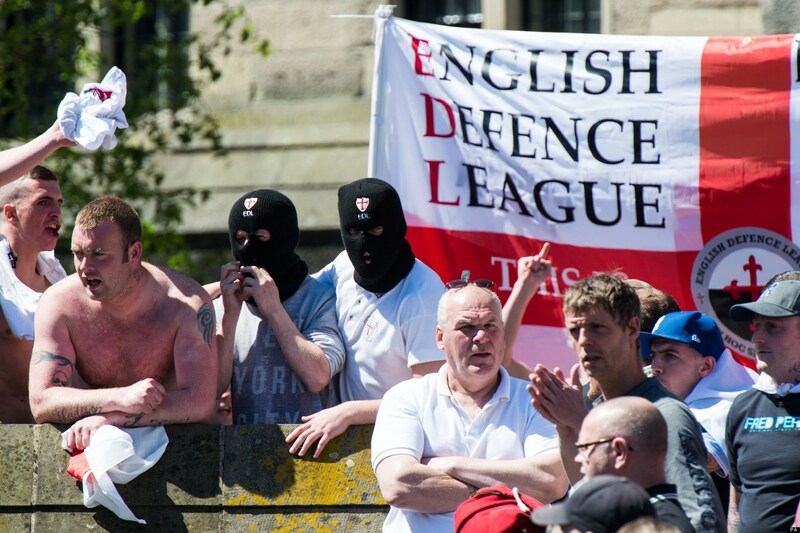 EDL demonstrations are often marred by ugly scenes of violence – especially if the police try to reroute the marchers or there are counter-demonstrations. More recently has been put forward by some – eg: Alex MacDonald & Olly Neville (2013) – that the rise of UKIP took a little of the heat out of the EDL’s campaign by providing a more socially acceptable route for the less violent members of the EDL to channel their frustrations and anxieties. (Another example of the Lower Right political structure influencing Lower Left passions and attitudes.) The issue of immigration is acknowledged by many commentators – eg: Anushka Asthana (2016) – to have been a key influence on the European Union membership referendum of 2016 resulting in a vote for the UK to leave the EU. Again, the composition of the structure (Lower Right) influencing change in attitudes (Lower Left) – though the change in attitudes will bring about one of the biggest changes in the UK’s post-war history, illustrating Giddens’ Structuration Theory. In February 2010 an even stronger earthquake hit Chile. Although this earthquake killed only hundreds – it was relatively far from Chile’s large cities and Chilean buildings tend to be sturdily built – again there was massive damage to the infrastructure. Obviously the effects of these earthquakes on the economy and society of each of these 2 countries will be felt for many years to come. Slower, more gradual changes in the environment can also have a large social impact. Eg: one of the negative effects of industrialisation has been the increase in pollution of the air, water, and ground. Jeffrey Reiman & Paul Leighton (2010) estimate the number of American deaths linked to air pollution ranges from a low of 10,000 to a high of 60,000 per year. Climate change is an even bigger issue affecting the whole planet. Stephen Schneider et al (2010) predict it will take at least a whole generation to come to grips with the effects of climate change. The relationship between culture and technology illustrates only too clearly how the Lower Right and the Lower Left interact. David Crowley & Paul Heyer (2011) note that changes in culture can change technology; changes in technology can transform culture; and changes in both can alter other aspects of society. 2 examples from either end of the 20th Century illustrate the complex relationship between culture, technology, and society. At the start of the century, the car was still a new invention – though they were were growing slowly but surely in number, diversity, speed and power. The car altered the social and physical landscape of North America and Western Europe and eventually most other industrialised nations in a massive way. Roads and highways were built; pollution increased; families began living farther apart from each other and from their workplaces…and tens of thousands of people started dying annually in car accidents. These are just a few of the effects the invention of the car had; but they illustrate how changes in technology can affect many other aspects of society. At the end of the 20th Century came the personal computer, which has also had an enormous impact upon the way people conduct themselves. Back in the early 1960s people wrote letters – often lengthy – which could take a day or more to arrive; television was only just seriously challenging radio and cinema as the main means of information acquisition and entertainment; and people queued at telephone boxes and fed in piles of coins to make a short call. E-mail, the internet and smartphones have enabled instant communication and make the world a much smaller place. Additionally tens of millions of people now use Facebook and other social media. At the time of writing, there has yet to be a full understanding of the part smartphones, YouTube and social media have played in the ‘Arab Spring’ and other uprisings but there is no doubt the role has been critical. It is claimed that once 20% of a population has the ability to exchange news and ideas through mobile calls and text messaging, it becomes very difficult for authoritarian regimes to control what the people are talking about. Eg: in 1982, when the forces of Hafez al-Assad put down an uprising in the Syrian city of Hama by slaughtering an estimated 25,000 people, most of them civilians, it took months for a true picture of the brutality to escape to the wider world. By contrast, from 2011 on Hafez’ son Bashir has had virtually every atrocity his forces have committed in attempting to suppress the civil unrest that grew into a civil war videoed and put on social media. These images have mobilised sympathy and some aid for the rebels in the Western nations whilst enabling neighbours like Saudi Arabia, Qatar and Turkey to justify arming the rebels. A key concern Don Beck (2002a) has raised about the influence of ORANGE-built technology beaming into many homes in areas like the Middle East is that it introduces concepts such as BLUE/ORANGE Western-style Democracy into PURPLE/RED tribal societies which have not developed sufficiently vMEMETICALLY to truly take on such concepts. Thus, in Iraq and Egypt where, after much bloodshed, there were free elections, the consequent governments governed blatantly in the interests of the sectarian and/or religious majorities which elected them, with little or no pretence of governing in the interests of the country as a whole. Which raises some of the issues discussed in the Blog post Well, are the Arabs ready for Democracy? Inevitably the world is becoming a smaller place through globalisation, with different cultures having more contact with each other. This contact leads to social change to the extent that one culture adopts some of the norms, values and other aspects of another culture. Western visitors to a poor nation should not be too surprised to find Coke, Pepsi, and other popular American products in vending machines and stores in various cities – an example of the influence of one culture on another. For better or worse, this impact means that the world’s diverse cultures are increasingly giving way to a more uniform global culture. For all Beck’s reservations, this process has been going on for more than a century and is probably unstoppable. The rise of newspapers, the development of trains and railroads, and the invention of the telegraph, telephone, and, later, radio and television have allowed cultures in different parts of the world to communicate with each other in ways not previously possible. Affordable jet transportation, mobile phones, the internet and other modern technology have taken such communication much, much further. Inevitably, though, there are consequences when cultures, which are in different stages of development or have developed in quite different ways, are juxtaposed with each other – which is where Beck’s concerns lie. ‘Pessimistic globalists’ such as Jeremy Seabrook (2005) fear that the world is becoming “Westernised” as Coke, Pepsi, McDonald’s, and other Western products and companies invade other cultures, to their detriment – what George Ritzer (1993) calls ‘McDonaldisation’ (sometimes also known as ‘Coca Cola-isation’). Others, such as Amartya Sen (2002), argue that Westernisation is a good thing because products such as refrigerators and computers do make people’s lives easier and, therefore, better. ‘Traditionalists’ hold that the impact of Westernisation has been exaggerated. Across the world, many cultures continue to thrive, and people continue to hold on to their ethnic identities. See What is Globalisation? for more on these arguments. Of course, Samuel Huntington (1993) sees conflict as an inevitable outcome of cultures coming into contact in the ways described and predicts other cultures will oppose Western interests to the point of violence – Huntington’s argument, to some extent at least, being reflected in the rise of extremist Islamist violence towards the Western world and its influences. Interestingly ‘Transformationalists’ point out that cultural influence is far from being all one way. Large amounts of immigration into Western Europe, particularly from the Middle East and the Indian subcontinent, in the second half of the 20th Century have bolstered workforces and changed dietary habits of the indigenous peoples. However, fast-growing numbers of now-settled second and third generation families with non-Western cultural and religious practices are presenting real challenges to the white/neo-Christian norms and values. See: Islamification: Europe’s Challenge? for more about this kind of issue. A personal anecdote: in Summer 2012 I moved back to Bradford after 20 years away from the city I had lived in for the previous 20 years. In the 2011 census 19.83% of Bradford’s population identified themselves as ‘Asian or Asian British’. An indicator of the impact this change in population demographics is having on the city is the fact that the lights now go up for Ramadan and Diwali as well as Christmas. The immediate impact that wars have on societies is obvious, as the deaths of countless numbers of soldiers and civilians affect not only the lives of their loved ones but also the course of whole nations. Eg: the defeat of Germany in World War I and the treatment of her by the victorious Allies led to an economic slump during the next decade that in turn helped create the conditions for the rise of Adolf Hitler. The rise of Hitler is almost a classic case of shattered post-war society and economy (Lower Right) producing immense dissatisfaction amongst the German people (Lower Left) and fostering an individual (Hitler in the Upper Left) who then exerts enormous influence upon the lower quadrants. In some senses at least, at the time – how ever repulsive to modern mindsets – Hitler fulfilled the role of a social hero and created a powerful minority influence. An interesting study by Patricia Marks (1990) focuses more on the micro-effects on the surviving ‘loved ones’ after the American Civil War. The deaths of so many soldiers left many wives and mothers without their family’s major breadwinner. Many of these women then had to turn to prostitution to earn a living, thus helping to fuel a rise in prostitution after the war. Much sociological and psychological discussion of social change tends to end with the achievement of change. But what happens in the aftermath? One effect, investigated by Radmilla Prišlin & Niels Christensen (2002), from reviewing a number of studies, found that being the ‘losers’ in the process of change can decrease satisfaction, increase hostility and lead to a desire to exit the group. Eg: following the end of Apartheid in South Africa and the implementation of multi-cultural Democracy, the research of Gillian Finchilescu & Andrew Dawes in 1998 found the newly-powerful black-dominated government produced little reported improvement in people’s lives generally whereas the newly-powerless white minority reported a significant deterioration in theirs specifically. Since 1995 the South African Institute of Race Relations, a think-tank, estimates a minimum of 800,000 whites have emigrated, from a population of just over 4 million (Scott Johnson, 2008). However, as Prišlin & Christensen note, in the social turbulence that follows major change, members of the newly-powerful group may also become unsettled and wish to exit. Not totally insignificant numbers of blacks and Indians have also emigrated from South Africa since the end of Apartheid. It’s also worth noting that Émile Durkheim (1897) found that the rate of suicide tended to increase in times of uncertainty and change as the laws and norms of society are often in a state of flux, producing a state of anomie (or lack of moral certitude). It’s no wonder Giddens talks about the ‘unexpected consequences’ of change!